Not my favourite posture, I’ll admit! Virabhadrasana 3 or Warrior 3 represents another aspect of the warrior Virabhadra in Indian mythology. (For just a little more detail on Virabhadrasana, click HERE). 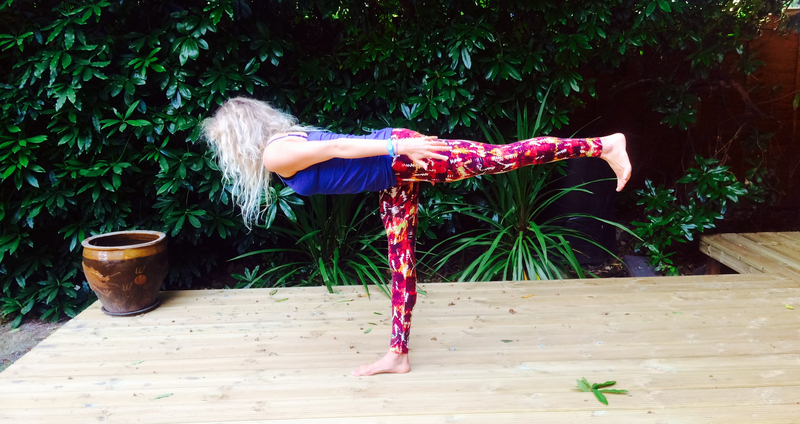 This asana is brilliant for strengthening the intrinsic muscles of the feet, the ankles, legs, hips and abdominal muscles, while testing our balance and will-power! The most important thing to remember?…. Breathe! Balancing postures are very reflective of our state of mind, and it’s easy to notice this throughout a yoga practice – the moment the mind wobbles, the body does too. This is why these are one of the most important groups of postures to practice; balancing and a busy head don’t lend themselves well to each other – so if it’s a quieter, more peaceful, clear and focussed mind you’re after, it’s a good idea to include balances in your daily practice. 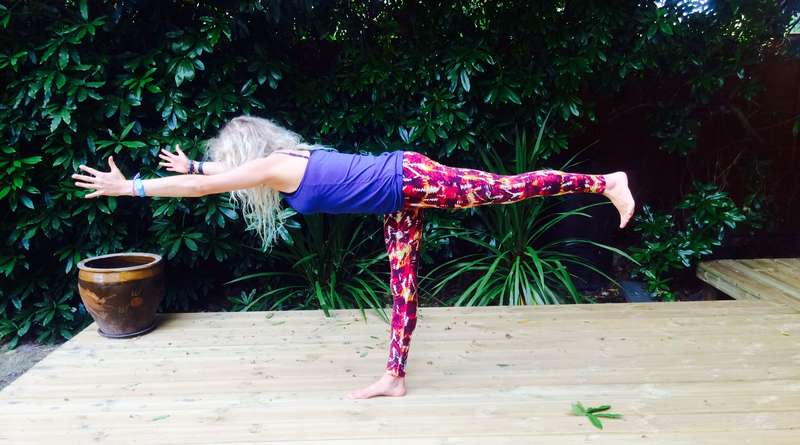 To prepare the body for Virabhadrasana 3, move through your surya namaskar A and B for a few rounds – it’s often a little easier to come into a more focussed state of mind after some movement! When you reach your next downward facing dog at the end of your surya namaskars, lower the knees, chest and chin to the floor, and lie flat to the ground. From here, practice salabhasana a couple of times to engage the lower back muscles (an important and often forgotten part of the core), and also to get that sense of reaching out through the top and bottom of the body. Moving on, come back in to your downward facing dog, and step one foot forwards between the hands for Ashta Chandrasana, our practice posture from last week. From an ashta chandrasana position (or a virabhadrasana 1 position), ground firmly through the front foot, spreading the toes and finding a nice stable foundation for yourself. Begin to extend the arms along side the ears (or along side the body, or out to the sides depending upon the variation you’re taking). Cultivating a little core awareness, draw up through the pelvic floor (Mula Bandha), and lift the lower belly. As you next inhale, lift the back leg from the floor – keeping it strong and straight – and begin to extend the body parallel to the floor in to a ‘T-shape’. If your T-shape isn’t ‘perfect’, then don’t worry! Just keep focussing on extending both through the fingertips and the back foot. There’s often a tendency for the hips to open out to the side here. If you notice this is happening, really be aware of levelling the hips to the floor (which can indeed feel a little uncomfortable!) by bringing the back toes to point downwards. Practicing with the back foot against the wall in order to really feel where the toes are pointing can be very useful for finding that parallel position of the hips. Flexing the back foot strongly is a great way to bring the attention towards what we consider to be our ‘core’, and can help bring muscular engagement and energy more towards the body’s center of gravity, and makes the posture much more about strength than wobbling around! Did I mention….. BREATHE?? If balancing postures have a habit of making you hold your breath, then learn to use the breath as your point of focus in a balance. In turn, this can be a useful lesson in keeping our breath steady through difficult situations. If your foot wobbles around – let it! Wobbling is really just what happens when the body engages different muscles in order to stay balanced, and your foot alone has 26 bones, 33 joints, and over 100 muscles…. they have to be doing something to help you balance here! (Plus, the more we desperately try to stop a wobble, the more wobbly it tends to get….) Do be aware of releasing the gripping of the toes though – I’ve recently heard this being described as panic toes, so instead of panicking and gripping tightly to the floor, ground the whole foot down firmly, especially the big toe joint, which is the part of the foot most essential for allowing us to balance. Take your drishti (gaze point) to something still on the ground in front of you to help steady your gaze and mind, and continue to breathe fully in the asana for 5-10 breaths – more if you’re able to. Variations: With the arms along side the body, or out along side the shoulders. This posture can also be practiced with lots of other arm variations to open the shoulder girdle, such as Garudasana, Gomukhasana, and by interlacing the hands behind the back. Come back in to your ashta chandrasana or Virabhadrasana 1, and step in to Tadasana (mountain pose) before moving on to the other side. If you have a busy day ahead, or you just can’t seem to quieten the mind recently, spend some time on balancing postures and notice your focus deepen and a bit of peace and quiet start to emerge.